A pair of researchers at the University of Colorado has found that preschool kids ate more vegetables when presented with segmented plates with pictures of fruits and vegetables on them. In their paper published in JAMA Pediatrics, Emily Melnick and Meng Li describe their study, which involved observing preschool children having lunch and changing the type of plates that were involved. It is a well-known fact that people of all ages in the United States do not eat enough fruits and vegetables—this is unfortunate, because prior research has shown that regular amounts of both are important for a healthy body. Prior research has also shown that the foods that children eat as they are growing up can have an impact on the food choices they make as adults. For these reasons, scientists have been searching for ways to get children to eat more fruits and vegetables. In this new effort, the researchers expanded on the findings of another team that found that segmenting the plates that teenagers used for their meals caused an increase in vegetable consumption. Their goal was to find out if the same might be true for preschool-age children. The experiments by the researchers consisted of measuring the amounts of fruits and vegetables eaten by 235 children at a local preschool. At the school, children were fed family-style, which means prepared food was put into large containers and set on a table where the children were able to help themselves. In the first go-round, plain white plates were used by the children. Then, four weeks later, the children were given segmented plates with pictures of fruit and vegetables in designated compartments. In comparing the amounts of fruits and vegetables used, the researchers found that the children dished themselves on average 13.82 grams more vegetables when using the segmented plates compared to the plain white ones. They also ate on average 7.54 grams more vegetables when using the segmented plates. They report also that the children ate slightly more fruit as well, but the difference was not considered to be statistically significant. The researchers acknowledge that their study was limited in scope and involved variables that were difficult to measure, such as waste, but suggest their findings indicate that plate design could play a role in coaxing kids to eat more vegetables. Children in the United States do not consume enough fruits and vegetables.1 One potential approach to change health behaviors such as fruit and vegetable consumption is to change the decision environment to make certain behavior more likely without altering incentives.2,3 For example, placing pictures of fruits and vegetables on lunch trays is associated with an increase in fruit and vegetable consumption among school-aged children.4 This potentially powerful intervention, however, has not been explored among children in early childhood (3-8 years of age), and dietary behavior during this period can be associated with life-long dietary practices.5 This study addresses this gap and tests the association between use of plates with fruit and vegetable pictures and consumption of fruits and vegetables among preschool children between 3 and 5 years of age. Part of the challenge as well is cooking the vegetables so that they actually taste good. Growing up it was primarily frozen bagged vegetables steamed which are absolutely tasteless garbage. Roasting (even with simple olive oil/salt/pepper to season) is much better. Not that it would necessarily cure a child's "verdiphobia," but roasting > steaming/boiling any day. 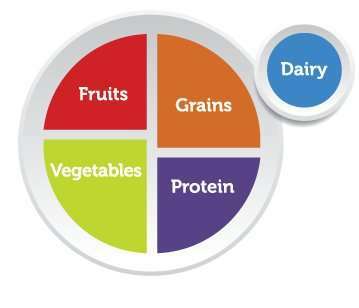 Vegetables, fruits and grains ALL contain protein... higher quality protein to top it off.